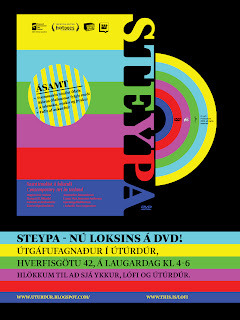 STEYPA is a feature documentary about the contemporary art scene in Iceland. Artists: Asmundur Asmundsson, The Icelandic Love Corporation, Gabriela Fridriksdóttir, Katrin Sigurdardóttir, Unnar Orn Audarson Jonasson, Huginn Thor Arason and Margrét H. Blondal. Emerging artists working in their hometown Reykjavík and abroad share with the viewers the diverse processes that spark works of art. Threading a line between realism and performance, the film explores inspiration and creativity through an intimate two-year collaboration, providing an insight into a booming scene. Pouring Coke into empty Fanta bottles, Ásmundur asks himself “What is art?” and suggests that it is embedded in everything that an artist does. Accordingly, the film monitors what the artists are up to before they deliver a finalized work of art. Gabríela kneads dough and smears on her face, Margrét is enchanted by gaskets in a rubber store, Huginn has his hair cut off and turned into a wig, Unnar rummages for plant cuttings in a home for the elderly, The Icelandic Love Corporation recreates Van Gogh’s Starry Night in liquorice and Katrín builds a small model of a house only to throw it off a bigger one. What is behind this commotion? Has Iceland anything to do with it? Does it concern the rest of us? Together with the artists, a group of friends, relatives and international art professionals help shed a light on these and other questions. The title, STEYPA, draws on the favorite sculptural material of Ásmundur, concrete. In Icelandic, the word is used both for the building material and all possible things that you don’t understand. The film is 67 minutes, in Icelandic with English subtitles.